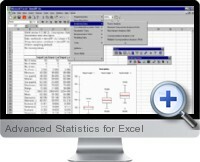 Advanced Statistics for Excel is a Microsoft Excel add-in that has been developed since 1993 to enhance the analytical capabilities of Excel. Advanced Statistics for Excel includes a wide range of technical analysis functionality covering most of the requirements for data analysis and statistics. Some Excel utilities have also been included to facilitate charting and data manipulation. All tools can be accessed from the Advanced Statistics for Excel menu item in the Excel menu bar, or by clicking on the buttons of the Advanced Statistics for Excel toolbar. Complementary time series analysis modules are also available. All Advanced Statistics for Excel functions have been abundantly tested against the best known statistical packages to guarantee that the results provided by Advanced Statistics for Excel are 100% reliable and compatible with what other packages would give. Preparing data: Data Sampling, Distribution Sampling, Discretization, Coding, Presence/Absence coding, Creating Dummy Variables, Coding by Ranks, Partition recoding, Transformation, Anamorphosis. Describing data: Descriptive Statistics (including scatter grams), Histograms, Normality tests (including q-q plots and p-p plots), Contingency Table (Two-way Table), Correlations and Similarity/Dissimilarity Matrix. Analyzing data: Factor analysis, Principal Component Analysis (PCA), Gabriel Biplot, Discriminant analysis (DA), Correspondence Analysis (CA), Multiple Correspondence Analysis (MCA), Multidimensional Scaling (MDS), Agglomerative Hierarchical Clustering (AHC), k-means Clustering Univariate Clustering. Visualizing data: Axes Zoomer, Easy Labels, Micro Mover, Plot transformer, Scatter plots, Parallel Coordinates. Modeling data and forecasting: Distribution Fitting, Linear Regression, ANOVA, ANCOVA, Logistic regression (Logit, Probit), Nonlinear regression, Nonparametric regression (Kernel and Lowess). Correlation and Association tests: Tests on Contingency Tables, Correlation tests, Mantel test, Parametric tests One sample t and z tests, Two sample t and z tests, Multiple comparisons tests, Two sample comparison of variances, k samples comparison of variances, Comparison of two proportions. Non parametric tests: Kolmogorov-Smirnov, Mann-Whitney, Wilcoxon's signed-ranks test and sign test, Non parametric Tests on k independent samples: Kruskal-Wallis' test, Non parametric Tests on k paired samples: Friedman's test. Tools: Data Flagger, Min Max Search, Delete Invisible Sheets, Delete Hyperlinks, Numerical Codes.